Teas have been used to improve the overall health and appearance of skin and hair for centuries. Rich in antioxidants and anti-aging and anti-inflammatory properties, tea is one of the most powerful grocery store staples that can be used topically. Chamomile tea is thought to have anti-inflammatory properties and therefore, is great to treat inflamed skin that results from a sunburn. Brew the tea and wait for it to cool. Once it cools, soak tea in something like gauze (make sure it’s clean) and apply to skin. PLace cold black tea bags over your eyes to get rid of puffy eyes and dark circles. The caffeine helps to shrink blood vessels underneath the skin and eliminate darkness around the eye area. 3.) Smelly feet? Soak ’em in tea! The tannic acid in tea is both antibacterial and antifungal, so it stops feet from sweating and smelling funky. As mentioned earlier, chamomile tea has anti-inflammatory properties. To take down the sting and bumps associated with bites and poison ivy, apply a used cold chamomile tea bag directly to the area. If your legs are itchy and red after shaving, try pressing a cool black tea bag onto your limbs. The tannins work to provide immediate relief from razor burns. We tend to stick with what we know. Chances are, as a teen, you found a skincare routine that worked and you stuck to it. Or, you never found a routine that worked and kept doing what you know. Let us be your time machine and we’ll tell your 13-year-old self about 3 pimple remedies you probably didn’t know about. Yes, #16 on the periodic table can help dry out your pimples! When applied topically, sulfur causes the skin to dry and peel. Despite how this sounds, it is actually a good thing for your skin if you have acne. First, sulfur helps reduce skin oiliness. Secondly, it helps the skin slough away cells more effectively, so pore blockages (AKA the beginnings of a breakout) don’t develop. Sulfur works best if you have mild blemishes or moderate acne. It really isn’t effective for severe acne or cystic breakouts. So, if you have red pimples, or blackheads, or a combination of the two, sulfur can improve your skin. Sulfur is also a really great option if you have sensitive skin! Some common ingredients in acne products, such as benzoyl peroxide, can be really harsh on your skin. Hydrocolloid dressings are little bandages doctors use on wound sites to help them heal. They work by drawing out the fluids produced by a wound and creating an environment where bacterial growth is prohibited. The flexible bandage can comfortably be left on for up to one week and is even waterproof so you can keep it on in the shower. Use these bandages after you popped a pimple to help absorb pus and oil and speed healing. These also work on cystic acne to bring them to a head. Do not pop cystic acne until they are at the surface of your skin. Do you have hormonal acne? Reddit users know that spearmint tea can be an effective way to stop breakouts! In the SkincareAddiction forum on Reddit, users tout spearmint tea as a huge factor in stopping their cystic hormonal acne. Skeptical? That’s okay! Spearmint tea also has other benefits, such as aiding in relaxation. Spearmint tea also has antioxidants! When you get a sunburn, you get inflammation in the skin similar to what you might get from a burn from touching a hot surface. It’s important to hydrate the skin and help repair the skin barrier as quickly as possible. Try using a lotion with aloe, and for ultimate relief, stick it in the fridge for 30 minutes before applying. Taking an over-the-counter anti-inflammatory pill (like Advil), can help reduce swelling and redness, plus help you deal with any pain. Putting an ice pack on the burn can also help bring swelling down. If your burn blisters it’s important to keep any blisters from popping. Don’t try to pop them yourself, or pick at them. You also risk infection by popping your blisters. Once your burn heals, using a Vitamin C serum on the skin can be very beneficial. The antioxidants in Vitamin C can help minimize the harmful aftereffects of a burn: free radical damage. What Does a Retinoid Do? If you’re into skincare, you probably have heard the term, “retinoid” before. But, do you know what it means, or if retinoids are even appropriate for your skin? Let us help you out! A retinoid is a derivative of Vitamin A. This class of vitamin A derivatives has been used in skin care since the ’70s. Retinoids increase cell turnover, so the skin is continually sloughing off damaged cells and healthy skin is always what you see on top. Retinoids also thin the top layer of skin, the stratum corneum, while thickening the smoother second layer, the epidermis, which makes the skin look luminous and firm. Retinoids also help clear dead skin cells, oil, and debris from pores, leaving them less distended; retinoids even decrease oil production—which is great for those who have acne. What type of skin is it good for? You can find a retinoid that can work for your skin, as long as you do proper research. If you have dry skin, you’re going to want to use a retinoid that’s hydrating. This means retinoids in an oil suspension. Be careful when using retinoids if you have hyperpigmented skin! Chances are if you have hyperpigmentation, you’re using a vitamin C serum. Vitamin C can make retinoids inactive. Instead, use a vitamin C serum in the morning to prevent further dark spots and a retinol product in the evening to repair damage. You can use any retinoid you like, as long as you don’t use it in combination with vitamin C.
Not sure if you have hyperpigmented skin? Check out our post to be sure. Those with sensitive skin are the most likely group to shy away from using retinoids. But, they can still reap some of the rewards, as long as they ease into it slowly. Start with retinol derivatives (retinyl palmitate, retinyl acetate, and retinyl linoleate) or natural forms of retinol (like chicory root, tara tree, and beggars stick flower), which are all gentler and less irritating. Retinol is great, but it needs some back-up. Use a face wash with benzoyl peroxide (an anti-inflammatory) or salicylic acid (which helps dry out excess oil) in the morning, and follow up with a retinoid at night, which will help stimulate cell turnover and lessen any post-pimple dark spots. Vitiligo is a long-term skin condition characterized by patches of the skin losing their pigment. The patches of skin affected become white. Often the patches begin on areas of skin that are exposed to the sun. Vitiligo develops when cells called melanocytes (meh-lan-o-sites) die. These cells give our skin and hair color. Scientists do not completely understand why these cells die. One type of vitiligo, non-segmental vitiligo, may be an autoimmune disease. An autoimmune disease develops when the body mistakes a part of itself as foreign. If the body mistakes melanocytes as foreigners, it will attack and kill these cells. Studies suggest that the other type of vitiligo, segmental vitiligo, has a different cause. This type seems to develop when something in the body’s nervous system goes awry. A few people say that the skin affected by vitiligo itches or feels painful. Living with vitiligo can cause other symptoms, such as low self-esteem and depression that is hard to beat. This can happen regardless of the amount of color loss or type of vitiligo. Patches of skin that are lighter in color are more susceptible to sunburns and blistering. Use sunscreen to help prevent skin damage. Like psoriasis and eczema, scientists theorize that vitiligo may be caused by your own immune system. Pigment cells in your skin produce melanin, the substance responsible for your own unique and individual skin tone. When these cells are attacked and destroyed by the body’s own defense system, they stop producing melanin, resulting in the skin becoming lighter, or even completely white! Drugs that suppress your immune system can have dangerous side-effects, and you can’t use them if you’re pregnant or breastfeeding. In this technique, your doctor uses a special surgical instrument to implant pigment into your skin. It’s most effective in and around the lips in people with darker complexions. In this procedure, your doctor creates blisters on your pigmented skin, usually with suction. He or she then removes the tops of the blisters and transplants them to an area of discolored skin. Possible risks include scarring, a cobblestone appearance and failure of the area to recolor. And the skin damage caused by suctioning may trigger another patch of vitiligo. Nobody really knows for sure how it works, but nobody is really sure what causes vitiligo either, although there are many theories. Phototherapy is one of the most common and successful vitiligo treatments, resulting in repigmentation of the pale skin patches by stimulating neighboring pigmentation cells (melanocytes) into producing skin color again. These neighboring cells are often located towards the edges of the affected areas, near the base of hair follicles, or possibly within the patch itself. Phototherapy appears to work by irritating the skin into working properly again. When prescribing phototherapy treatment, doctors may select either Ultraviolet A (UVA) light used in combination with the drug psoralen, or narrowband Ultraviolet B (nbUVB) light alone. Generally, patients who respond to narrowband UVB phototherapy can obtain over 90% repigmentation within a year – and without any of the adverse side effects that accompany the use of psoralens! If your vitiligo is causing depression and anxiety, seek help by talking to a psychologist or psychiatrist. If you’re on the east coast right now, chances are it’s hot and you’re miserable. Those of you in the Southwest and South probably already know this, but you need to take special care of your skin in the extreme heat. Whether it’s cold and dry or hot and humid, an area’s climate can really affect the skin all over your body, causing everything from acne breakouts to itchy dry patches. Extremes in weather — both hot and cold — can exacerbate some existing skin conditions or even cause new ones. We’ll be focusing on what to do when the weather is hot in this post. Stay tuned for what to do with your skin when the weather is cold. Regardless of the humidity, using sunscreen is so important. The sun’s rays cause about 90% of injury to the skin, which means sagging, wrinkles, uneven pigmentation, thickening, and general signs of aging. Sunscreen works by blocking/reflecting the harmful rays that cause sunburns and skin damage. This can help prevent breakouts! When old skin cells start to pile up on the surface of the skin, it can leave skin looking dull, rough, and dry. Also, the build-up of dead skin cells can result in excess oil and clogged pores, leading to breakouts. This gets worse in hot climates. You sweat more, causing more oil. This means that you’re more likely to breakout, especially if you’re not getting rid of dead skin cells and oil by exfoliating. Check out our post “5 Easy Ways to Step Up Your Skincare Game” for a recipe for a sugar scrub. Pro tip: If you’re prone to bacne and heat rash, try dry brushing. Dry brushing removes dead skin cells, which prevents clogged pores. Like bacne, heat rash occurs when sweat ducts get closed off, trapping the moisture under the skin and leading to a rash. Heat causes redness and inflammation. That’s why if you go outside for a while, you come back inside flushed and sometimes puffy. 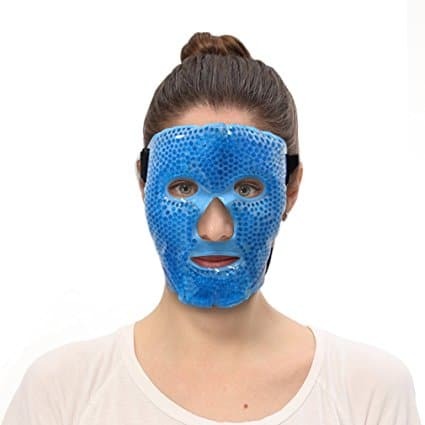 You can put a sheet mask in your fridge and apply that to your face, or you could buy a hot/cold gel bead mask. Cold will reduce inflammation, which causes redness and puffiness. Heat makes you sweat more, which can make you dehydrated. Skin is made up of three layers — the outer layer (epidermis), the underlying skin (dermis) and the subcutaneous tissue. If the outermost layer of the epidermis doesn’t contain enough water, skin will lose elasticity and feel rough. Drink water to help the epidermis get the water it needs. In addition, if you live in a dry climate, consider getting a humidifier.